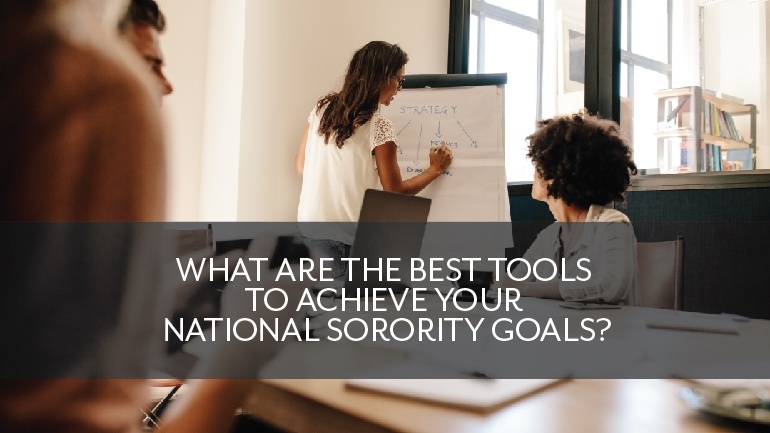 What Are the Best Tools to Achieve Your National Sorority Goals? Girls run the world, as Beyoncé says. There are roughly 9 million undergraduate Greeks in the country, so it stands to reason that sorority women wield a fair amount of the worldly power Miss Knowles speaks of. After all, sorority women are taught to seek higher values and goals, to take stock of their own inner strengths and to seek success in the face of hardship. Most importantly, sorority sisters know that they don’t need to go it alone or to take the most difficult path every time. They’re taught to use the tools at hand to achieve their objectives and to do so as efficiently as possible. Tools can come in physical form, or they can come in an intangible form such as educational resources. Sometimes, even people can be tools. We don’t mean it as the insult it sounds like. Networking, as well as seeking guidance and resources from others who may be able to help you with sisters’ needs, forms an essential part of what sisterhood is all about: working together to achieve greatness. Sometimes a sorority chapter’s goals are local. Sisters take part in their communities on campus and locally. Local connections and goals are a chapter’s lifeblood. Yet there are times sisters have their eyes on the bigger picture, and want to take their ideas from one coast to the other. That’s why OmegaFi wants to talk about The Best Tools to Achieve Your Nationals Sorority Goals. Advisors for a sorority’s national organization are going to be any chapter’s first go-to source for their national goals. When it comes to chapter goals, national advisors can guide sisters through many potential setbacks and help the chapter grow stronger in accordance with national standards. Say your chapter has an idea for partnering a philanthropy event with a national charity, and you feel it’s something that can benefit other chapters and colonies as well. The charity is reputable and is looking for a partnership beyond the immediate community. Bringing national advisors onboard can open channels to broaden your philanthropy to a nationally recognized event by helping expand it to other chapters, both boosting the proceeds to the charity exponentially and putting your chapter on the map. National advisors will have broader insights about sorority trends and goals that sisters may not have access to as undergraduates. So when you’re trying to take your goals national, turn first to those who know best. Sometimes you may be trying to plan a national event such as an alumnae banquet or national sorority leadership conference. You may need to communicate with alumnae at a distance as well as other chapters to coordinate event preparations, figure out who’s going to be attending and who’s volunteering to help put things together. On the other hand, you may see that another chapter has pulled off a chapter-specific goal or event that you think your chapter would benefit from as well. In that case, it’s appropriate to visit their chapter website or Facebook page in order to contact the appropriate chapter officers. Other chapters can give you a great jumping off point for ideas for goals, and you can coordinate these with national advisors as well. It’s also important to keep a strong line of communication and engagement with your alumnae. Alumnae are a great resource not only for guidance, but for fundraising efforts. Your chapter may want to start a national endowment program, and to do so will require a significant fundraising effort and donations from your alumnae. A professional fundraising company such as Pennington & Company may also be a great tool to help sisters plan and execute their fundraising campaigns by getting alumnae involved and engaged. It’s important to do fundraising right, especially when you’re shooting for the moon. Well, not the moon. But we know finding the right tools to achieve a national sorority goal can make you feel a bit like astronauts blasting off into the vacuum of space. Thinking of your sisters and alumnae across the United States as ground control, guiding you safely among the stars. Software is a great tool for planning and achieving your sorority chapter’s national goals. For a great many of these national goals, a chapter needs effective financial management. A good way to achieve national goals is for officers to budget using sorority financial software. This ensures that all financial goals are accounted for and the funding of your projects can go off without a hitch. When communicating with other chapters, alumnae, national advisors or representatives of partner organizations over a larger-scaled project, communication software helps as well. For internal chapter communication and chapter management there’s GINSystem. But there are also a variety of software options for sororities communicating with outside parties at a distance, including Slack, Trello, Basecamp, Planning Pod and more. Ultimately you’ll want to use the software that best fits your needs. For instance, Slack is perfect for fast, compartmentalized communication and formal video or voice conferences, file sharing and integration with tons of other apps. On the other hand, the Planning Pod software is specific to event planning, and its functions center around that goal. Whatever a sorority chapter’s goals, taking things to the national level takes guts, determination, and the right tools. We’d love to hear about a national goal your chapter has achieved or is planning right now, and what tools you think are best to get the job done. Let us know in the comments below.